And what is Christmas without chocolate? Well, in my book, it’s not up to much. And seeing as it’s a special day, just any old chocolate won’t do. Something rather special is called for. So it give me great pleasure to present to you some of the best chocolate around – Zotter. Austrian chocolatier, Josef Zotter has made a name for himself for producing high quality but quirkily individualistic chocolate. He has also set himself apart from his peers with a staunchly ethical approach to production methods: all Zotter chocolates are fairtrade and organic. Not only that, but packaging is carbon neutral – cardboard outer and organic plastic which is claimed to be 100% biodegradable. All chocolate is handmade, from bean to bar. So far, so good. It seems that Austria’s pivotal role as a cradle of chocolate innovation continues from the far-off days of the Sachetorte down to the present. The packaging is also highly individual with striking, colourful and sometimes impressionistic illustrations on the wrappers. Once the wrappers have been removed, the chocolate bars themselves are unusual in appearance and the fun and general air of excitement continues once the bars are tasted. I was recently sent four bars to try. 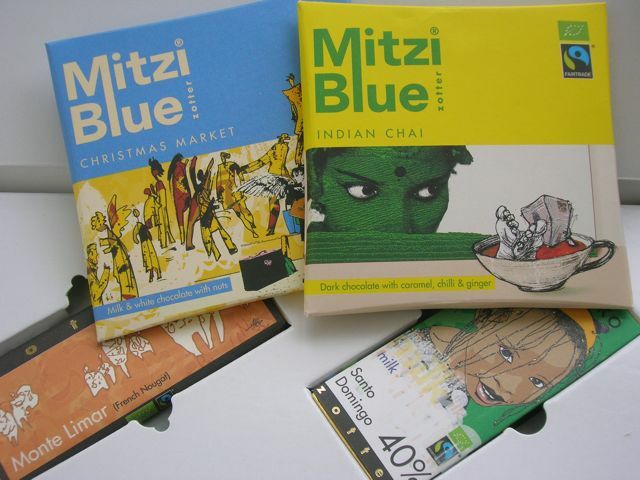 Mitzi Blue (Indian Chai) – The chocolate is round like the wheel of a wagon with a slightly off-centre hub and geometric patterns scored into the surface. The hub tastes of spicy hot sweet chai milk tea; the outer disc is of dark chocolate which is beautifully smooth and melts wickedly in the mouth. The dark chocolate is unusually sourced from Kerala in India and is 68% cocoa. It is refreshing and zesty with citrus notes but a hint of coffee bitterness slowly inveigles its way onto your palate. French Nougat – This is one of the 70g hand-scooped bars that Zotter are now famous for. I couldn’t wait to try this one. First off the chocolate was a dark milk with 60% cocoa, my favourite kind, but one which is very hard to get hold of. It was filled with a layer of salty honeyed pistachio and hazelnut nougat on top of a layer of cinnamon and ginger flavoured almond praline. This is the most divine bar of chocolate I’ve had in a very long time; all of my favourite flavours in one bar made doubly interesting by the layers of flavour and interesting textures. One to truly savour. We are off to Cambridge for a few days – anything to escape the incessant rain and Cornish floods. Just in case I don’t happen to get any special chocolate this year, I’m saving the other two bars for emergency rations. I love Zotter chocolate. My favourite is the unique “Mitzi Blue Überdosis”. It is made with goat milk. I have heard so much about this chocolate. Looks delicious.